This overview of the Balkan wine region was put together after visiting many of the better known appellations in the Balkan wine region of South-East Europe on numerous occasions. Today, I am enamored with the wines. That makes all the more gratifying to see wines from the Balkan wine region finally gaining traction with more than sommeliers, they are now being looked at by wine loving consumers all over the world! The number of wine lovers visiting and tasting the wines from the Balkan wine region continues to grow steadily. Due to technological innovations, state-of-the-art equipment and a wave of young and educated viticulturists and winemakers with international experience, the Balkan wine region has finally started producing the top quality wines in a wide range of categories. The Balkan wine region currently produces around 2 million tons of wine annually. That is a lot of wine. If we assume this region is one entity and do a quick comparison, only four wine producing countries; Italy, France, Spain and America produce more wine. In 12 countries I regularly follow, there are more than 2,000 commercially relevant Balkan wineries operating at present! It is evident that the sheer size of the regional wine industry creates an extremely strong base for the fast development of Balkan wine production and wine culture in general. The quality of Balkan wine remains uneven at the moment. However certain trends are already becoming established. Slovenian wines have been getting great attention for quite some time. Croatian indigenous varieties from the Dalmatia and Istria are suddenly gaining in popularity with consumers all over the world with many claiming they are the new ‘flavor of the year’. 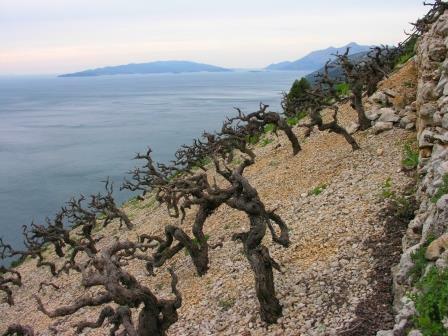 Numerous countries are active today in the Balkan wine region. Bulgaria has really started coming on strong as a Balkan wine producing nation. After earning a reputation in the West as a producer of mostly cheap, value-for-money red wine often made from Cabernet Sauvignons, things have changed. Today Bulgaria strongly demonstrates the ability to produce top quality red and white wines, both from local and international varieties. In fact, some producers who also own famous estates in Bordeaux are now making wine in Bulgaria. Stephen von Neipperg, the owner of Chateau Canon La Gaffeliere and other estates in St. Emilion is leading the way in the growing Bulgarian wine trade. Bulgarian cuisine is another factor in the regions growing popularity, as it pairs well with many of the regions dishes. Similar to Bordeaux, as an example, both appellations include a lot of lamb in their diet. Serbia is another fast growing wine country in the Balkan wine region that is now capable of producing the world class wines, and not only from their famous local varieties, Prokupac used in the production for red wine and Tamjanika, which is used for making white wine. Greece is another hot bed of activity these days! While most Greek varieties were not previously well-known, except by local consumers and sommeliers, that is no longer the case today. Robert Parker and The Wine Advocate recently hired Mark Squires to write about the Greek wine region, which has helped shine a light on Greek wines. Consumers are now more comfortable looking at wines made from Assyrtiko, Agiorghitiko and Xinomavro for example. Turkey is also undergoing a true renaissance in wine making with a wine culture that is going from strength to strength. What makes this even more incredible is that this is taking place irrespective of some cultural reasons that prevent consumption of alcohol! Romania is a home of many great wines; again both form local and international varieties. Macedonia is a serious producer of both top-of-the-range and easy-drinking lifestyle wines, which is already recognized globally. If we add to this list interesting wines coming from Hungary (both world-renown sweet wines from Tokaj and dry wines from Villány (red) and Eger (white) and other regions), Montenegro, Bosnia, Herzegovina, Albania, and even Moldova – it becomes obvious that the real wine revolution is taking place in the South-East European region. The more exciting indigenous varieties from the region include: Furmint and Hárslevelű from Hungary, Plavac Mali, Malvasia Istriana and Pošip from Croatia, Blatina and Žilavka from Herzegovina, Prokupac and Tamjanika from Serbia, Vranac from Macedonia and Montenegro, Bulgarian Mavrud and Gamza (Kadarka), Romanian Fetească Neagră, Greek Assyrtiko and Agiorgitiko, and Turkish Kalecik Karasi. Of course there are many more that need to be explored and appreciated. My favorite wine regions are Croatian Dalmatia and Istria, Serbian Župa and Eger and Tokaj in Hungary. Of course there are many more regions that I love and I have yet to discover, as my mission to visit all wine regions in this part of the world is an enormous task and requires time. My favorite variety is Plavac Mali, grown almost exclusively in Dalmatia. Plavac Mali is only red variety that completely adapted to the Mediterranean climate of the Croatian coast and it gives full-bodied wines with the amazing complexity. As you can see, the wine story from the Balkans is steadily gathering pace, and EU integration for many of its winemakers has undoubtedly opened up new possibilities. Established global wine markets are discovering the secrets of the South-East European region’s wines, and indigenous grape varieties. This is a positive trend that should continue to grow as the word gets out to adventurous consumers around the world.